Modern living seems full of right angles. Wherever you turn, there are corners -- on buildings, windows and doors. More can be found on car bumpers, road junctions, walls and street lamps; they are everywhere. These right angled structures allow the urban sprawl to slot together, forming a connection that contains the hustle and bustle. Rigid and strong and economical on space, they have become a symbol for our crowded towns and cities. 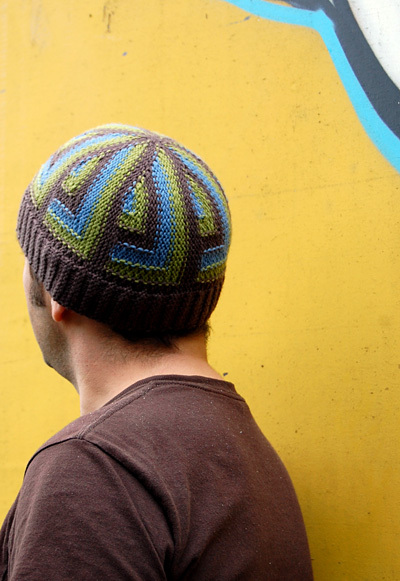 This hat explores a new way of knitting right angles. Worked on straight needles -- knitted sideways, and then grafted at the end -- the color sections are worked as stripes with some intarsia. 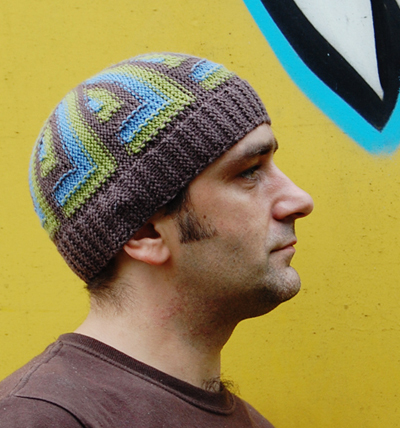 This is an ideal hat for lovers of angles and straight lines who may be in need of something warm and woolly to soften the edges. Note: Colonial Blue has been discontinued. Fjord Heather is a good substitute. Directions for the crochet cast on method used for this project can be found here. Wrap & turn: Bring yarn between needles to front of work, slip next stitch to right needle, bring yarn around this stitch to back of work, slip stitch back to left needle, turn work to begin purling back in the other direction. This hat is designed in reverse stockinette st, so that the 'purl side' of the fabric faces out. If you decided you prefer the stockinette st side of the fabric, the short row wraps will be picked up differently. Short row wraps are picked up on the last row of each panel – a WS row, which is a knit row. If you plan to use the reverse stockinette st face of the fabric as the RS, when you come to a wrapped st, pick up the wrap by inserting the tip of the left needle into the back of the wrap and knitting it together with the st. The wrap will show on the stockinette st face of the fabric. If you plan to use the stockinette st face of the fabric as the RS, when you come to a wrapped st, slip the st to the right needle, insert the tip of the left needle into both the front of wrap and the st, slipping it back to the left needle; knit the wrap and stitch together. The wrap will show on the reverse stockinette st face of the fabric. 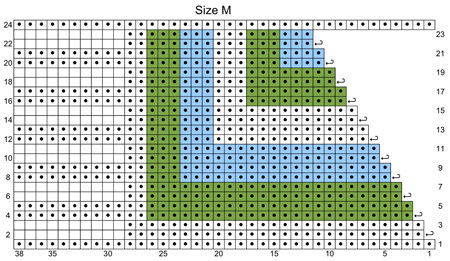 This pattern involves the Intarsia method of color work. When working in this way, different sections of each row are worked with different colors. Use a separate length of yarn for each area of color. When switching from one color to the next within each row, drop the color you have been knitting with, and bring the yarn for the next color up under the yarn of the previous color before you continue knitting. This will twist the 2 yarns around each other. It is very important to do this; if you do not wrap the yarns in this way, the areas of color will not be joined, and you will have holes in your work. To make economical use of the yarn, I used both ends of the ball for each chart repeat. This may seem like a messy idea, and the yarns did get a little tangled, but at the end of each panel all yarn tails are cut except one strand of MC (which is needed for ending and starting each panel), which keeps the tangle from getting out of control. If you prefer, each ball of yarn can be divided into two smaller balls. 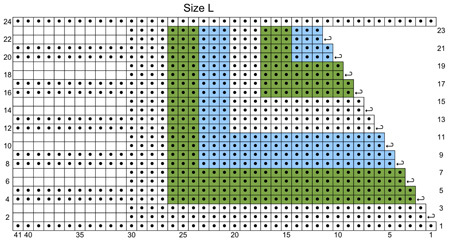 Using waste yarn and method shown in linked article (see Pattern Notes), CO 35[38, 41] sts. 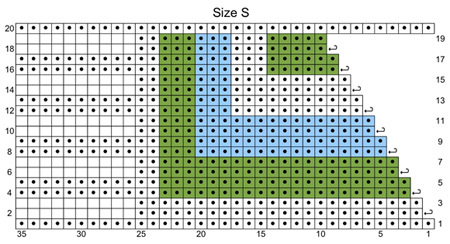 Following chart for your size, work as follows. When working Row 20[24, 24] of chart, pick up wraps and work them together with wrapped sts (see Pattern Notes). Break all strands of CC1 and CC2, and secondary strand of MC, at the end of each chart repeat. Size S: Work Rows 1-20 five times, then work Rows 1-19 once more. Size M: Work Rows 1-24 five times, then work Rows 1-23 once more. Size L: Work Rows 1-24 six times, then work Rows 1-23 once more. Read through the grafting directions below. If you find the idea of grafting across short rows too daunting, work the final row of the chart before breaking the yarn. Draw tail through edge sts of each panel at top of hat before grafting. This will effectively add one row of MC to final panel of the hat. Remove waste yarn from CO edge and carefully place resulting live sts on needle. Break the yarn, leaving a tail approx. 1 yd long. With stockinette st face of fabric facing, graft live sts on working needle together with sts of CO edge. When grafting across short rows, pick up the wrap as you have done previously and place it onto the needle, lift both the wrap and stitch off and twist towards you, then place them back on the needle before grafting them as one stitch. When grafting is complete, draw yarn through edge sts of each panel at top of hat and pull tight. Neatly weave in all ends - careful weaving will make for a fully reversible hat. Gently block hat to allow the color changes to become even and smooth. 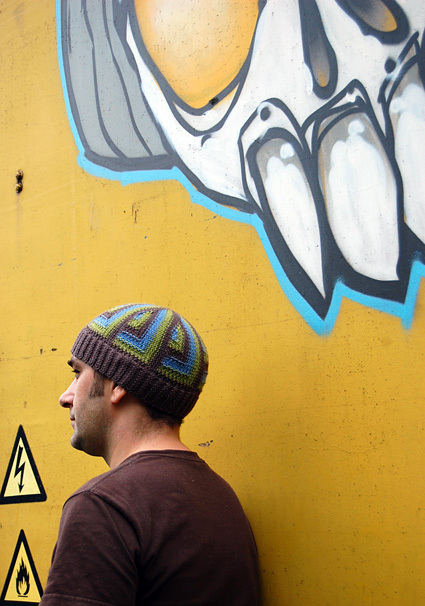 Woolly, author of 'Going Straight – A New Generation of Knitted Hats', is constantly dreaming up weird and wonderful hat designs. She lives in a bus with her partner, son and stash, roaming Europe in search of the best yarn stores, festivals and sheep.